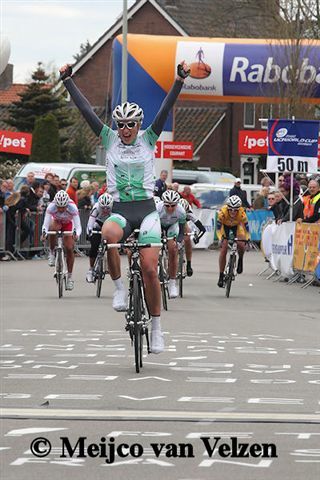 Loes Gunnewijk (Nederland Bloeit) won the women’s World Cup Ronde van Drenthe. She won the Dutch World Cup race after attacking in Hoogeveen a lead group. That group included twwelve other riders with one kilometer to go. Loes Gunnewijk’s teammate Annemiek van Vleuten gave her team and Holland double the reason to celebrate by taking second place. Italian Giorgia Bronzini (Gauss RDZ Ormu) finished third. Last year Loes Gunnewijk was second. She said: ,,That place for one year felt like a victory. Because it ended a period of misfortune at that time. But really, the win is even more beautifull. After a race with many attackes at the cobblestones and the three climbs up the VAM-berg (a hill near the village Drijber). The winner attacked when things started to get quiet among the race’s leaders. Just before the final sprint would have begun. After her attack, she was encouraged by her team leader Jeroen Blijlevens. After the race Loes Gunnewijk was e very happy woman. ,,My team leader Jeroen Blijlvens shouted in my ear that I had a gap and had to keep going. That I succeeded is a dream come true. I have been, for a number of years, often close to a vivtory in a World Cup. But now I’ve got one. Loes Gunnewijk’s teammate Marianne Vos retained her lead in the World Cup standings.